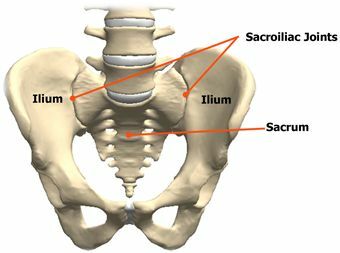 Sacroiliac Joint Dysfunction occurs in the sacroiliac joint where the flat, triangular shaped sacrum bone at the base of the spine interconnects with the pelvis. The symptoms of sacroiliac pain can be similar to those of sciatica – pain in the buttocks and down the leg – but sacroiliac dysfunction is a different problem from sciatica. Hypo-mobility meaning that the joint is stuck, unmoving. Hyper-mobility meaning that the joint is too loose. Sacroiliac Joint Dysfunction is possible on either the stuck or loose side but will usually possess a different quality of discomfort. When the SI joint is stuck it will likely have a restricted, tight feeling. You feel you want to stretch it out all the time, and may twist your body into various contortions in an attempt to gain relief. In such cases, the fascia, the muscles, and even the deep ligaments around the joint may have adapted to a shortened state. Various influences can cause tissues to shorten including a sedentary lifestyle and trauma (such as a fall where there’s impact to the tailbone). I also see a high incidence of tightness in the sacroiliac ligament and the surrounding tissues in women who have given birth. Near the end of pregnancy, hormonal changes cause the sacroiliac joints to relax in preparation for delivery. But there seems to be a rebound effect where the tissues around the sacrum tighten up again resulting in Sacroiliac Joint Dysfunction. I’ve witnessed in many, many of my post-partum clients. Presumably, this is the body’s effort to stabilize the area, but in this respect, the body can be like a child that doesn’t know her own strength: the tissues can overstabilize to the point of creating restriction. A stuck sacroiliac joint can be an uncomfortable thing. Relieving it, however, can be relatively easy; no more difficult than lengthening the restricted tissues by applying direct, myofascial or deep tissue therapies to the area. Mobilizing the area in as many ways possible is recommended. For a complete range of extremely effective stretching techniques see my Stretching Videos page. I also recommend a daily routine of Somatic Exercises, which are slow gentle movements that mobilize the deep, intrinsic muscles and ligaments. This is essential for maintaining sacroiliac flexibility. The more extreme pain of a hypermobile or loose SI joint (as compared with a stuck SI joint) is the result of the tissues being strained, overstretched, often to the point where the nerves are irritated. Hypermobility means the joint is unstable, and that the ligaments intended to secure it in place and restrain it’s motion have become lax. Direct stretching, in this case, will not relieve the pain because the area is already overstretched and strained. In fact, stretching a hypermobile joint will worsen its state. 1) Correct pelvic imbalances. Without correcting pelvic torsion, upslip/downslip, and inflare/outflare (if any exist), it’s impossible to achieve lasting relief for Sacroiliac Joint Dysfunction. Leaving pelvic imbalances untreated will mean the larger structural problem is still creating strain. 2) Release the opposite SI joint. The opposite SI joint is often fixed and stuck, even if there’s no discomfort there. A fixed joint on the opposite side of the hypermobile joint will increase the amount of play or motion in the hypermobile joint. Increased play or motion increases the feeling of strain. 3) Release the muscles and fascia on the opposite side. Muscles such as the opposite piriformis and deep hip rotators, the opposite sacrotuberous ligament, and the opposite gluteals, especially the gluteus maximus. 4) Release the opposite iliacus muscle. Often on the side of a fixed SI joint will be found an equally fixed iliacus muscle. This must be released in order to reduce strain in the hypermobile SI joint. 5) Evaluate and release any other tissues around the hypermobile SI joint. These might include the sacrotuberous ligament on the same side, the piriformis, and sometimes the iliolumbar ligament. 6) Once pain has been reduced in the area, it’s important to stabilize the hypermobile SI joint by strengthening both the core of the body (especially the transversus abdominus and oblique muscles), and also the hip extensors on the same side. Another method for treating Sacroiliac Joint Dysfunction by stabilizing a hypermobile SI joint is called Prolotherapy. This method involves the injection into the sacroiliac joint of irritant substances, with the goal of causing inflammation and scarring. The hoped-for result is that the joint will become more stable. I have not heard a clear endorsement from any of my clients who’ve tried this method. However, if preceded by structural correction of the pelvis and manual therapy release of all stuck areas first, then Prolotherapy may have some merit. Are You Experiencing Unexplained Back, Hip or Leg Pain?